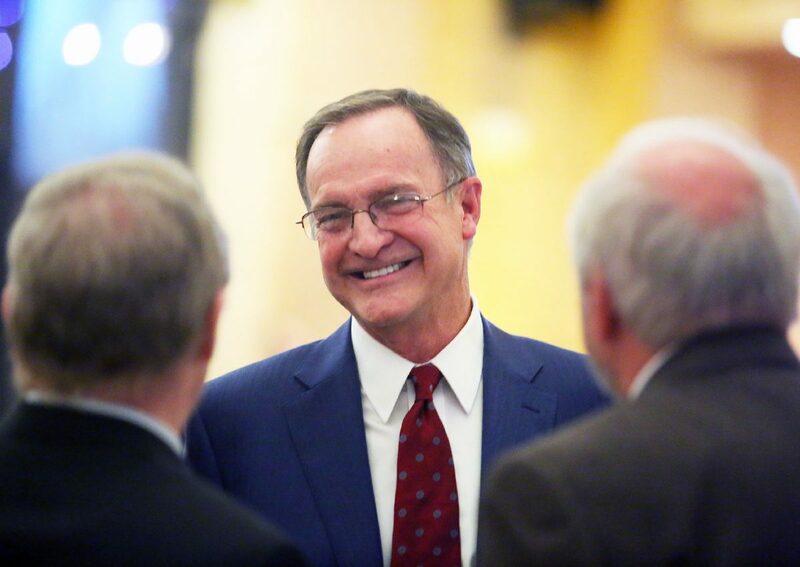 Former Pan American University head basketball Lon Kruger, center, talks with McAllen mayor Jim Darling and University of Texas presidents Guy Bailey during his induction into the University of Texas Rio Grande Valley Department of Intercollegiate Athletics Hall of Fame and Hall at the Valencia Event Center on Thursday, Nov. 8, 2018, in McAllen. 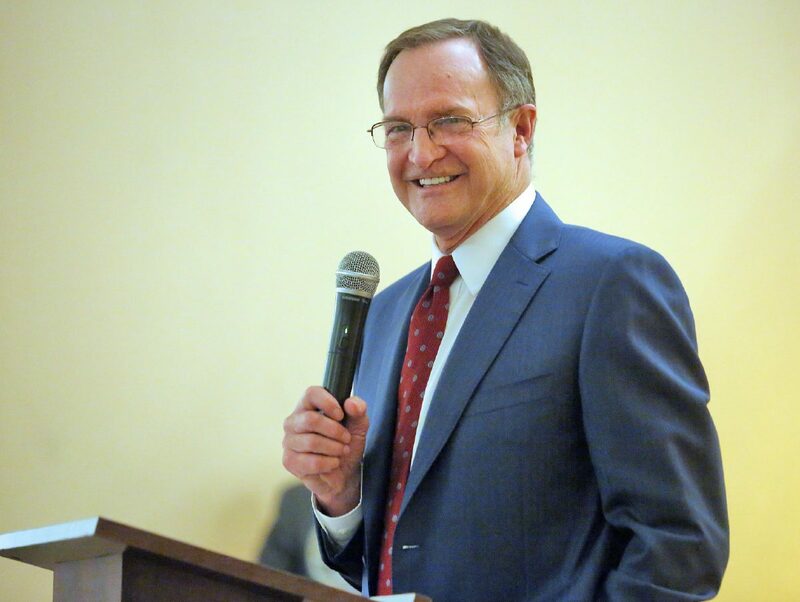 McALLEN — Former Pan American University men’s basketball coach Lon Kruger may not have known it when he arrived at the school in 1982, but Thursday night was 36 years in the making. UTRGV inducted Kruger, who is Oklahoma’s current men’s basketball coach, into the athletic department’s Hall of Fame and Lon and wife Barbara Kruger into the UTRGV Athletics Hall of Honor at a ceremony at the Valencia Events Center in McAllen. Pan American hired Kruger away from Kansas State where he served as an assistant basketball coach for his alma mater. PAU was Kruger’s first college basketball head coaching job. 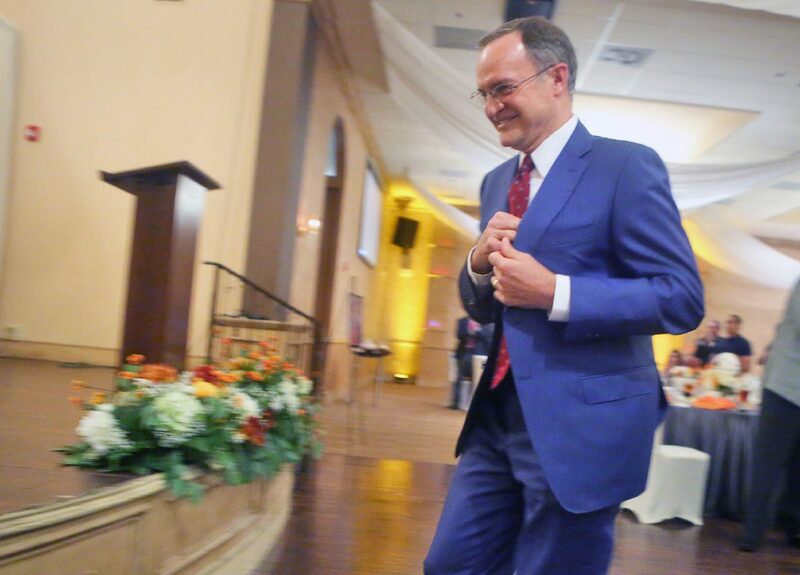 Former Pan American University head basketball Lon Kruger walks to the stage during his induction ceremony into the University of Texas Rio Grande Valley Department of Intercollegiate Athletics Hall of Fame and Hall at the Valencia Event Center on Thursday, Nov. 8, 2018, in McAllen. Former Pan American University head basketball Lon Kruger speaks during his induction into the University of Texas Rio Grande Valley Department of Intercollegiate Athletics Hall of Fame and Hall at the Valencia Event Center on Thursday, Nov. 8, 2018, in McAllen. 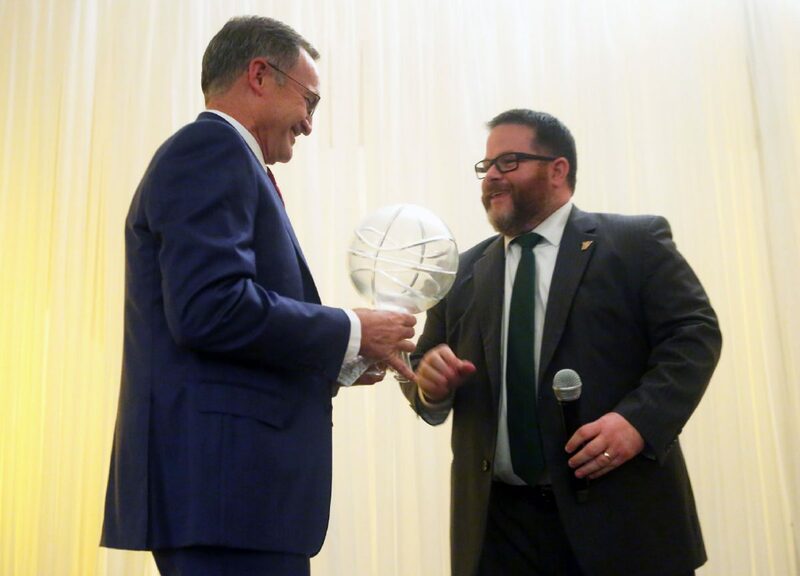 Former Pan American University head basketball Lon Kruger, left, is given the University of Texas Rio Grande Valley Hall of Fame Award during his induction into the University of Texas Rio Grande Valley Department of Intercollegiate Athletics Hall of Fame and Hall at the Valencia Event Center on Thursday, Nov. 8, 2018, in McAllen. 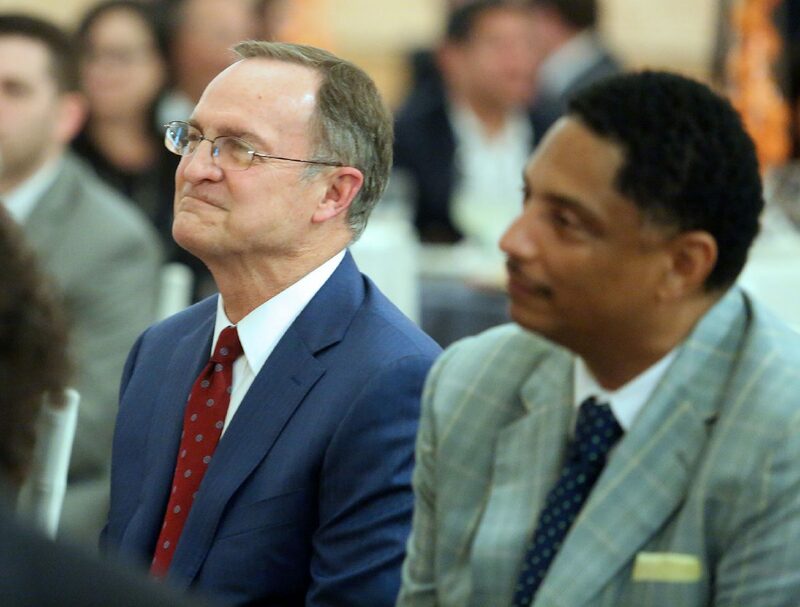 Former Pan American University head basketball Lon Kruger, left, listens a speech seated next to University of Texas Rio Grande Valley head basketball coach Lew Hill during Kruger's induction into the University of Texas Rio Grande Valley Department of Intercollegiate Athletics Hall of Fame and Hall at the Valencia Event Center on Thursday, Nov. 8, 2018, in McAllen. 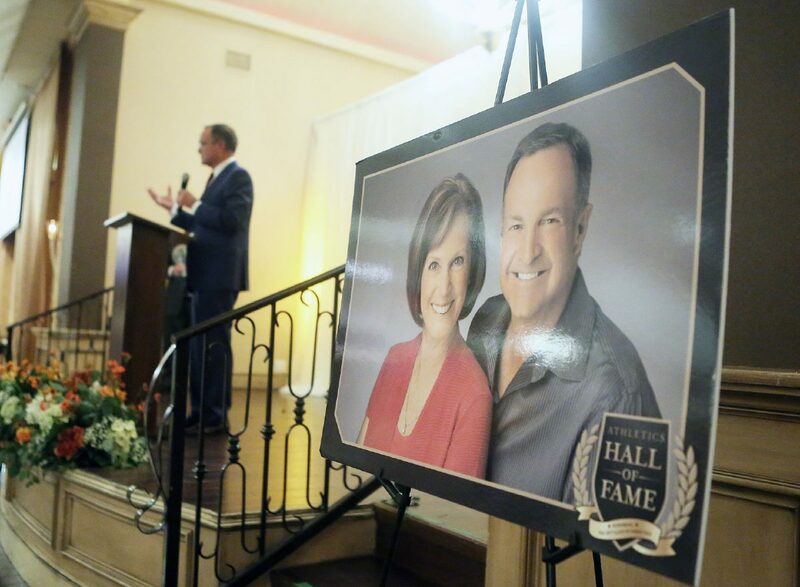 A picture of former Pan American University head basketball Lon Kruger and his wife Barbara is displayed as Lon Kruger speaks during his induction into the University of Texas Rio Grande Valley Department of Intercollegiate Athletics Hall of Fame and Hall at the Valencia Event Center on Thursday, Nov. 8, 2018, in McAllen. Kruger coached at PAU for four years and compiled a 52-59 overall record in Edinburg. His finest season was his final season. The Broncs went 20-8 during the 1985-86 season, equaling the program’s highest winning percentage (.714) which happened in 1980. Programs took notice of Kruger’s achievement and one in particular zeroed in on him as its top target: his alma mater Kansas State. Kruger rejoined the Wildcats after the 1985-86 season and began a stretch of success few NCAA Division I head coaches have ever experienced. Kruger coached Kansas State (1986-90), Florida (1990-96), Illinois (1996-2000), UNLV (2004-11) and Oklahoma (2011-current) to NCAA Tournament appearances at each institution, becoming the first head coach to achieve such a feat. Sprinkled in between his college coaching years are coaching tenures leading the Atlanta Hawks (2000-03) and assisting on Don Chaney’s staff with the New York Knicks (2003-04). But the Valley, and specifically UTRGV, have always held a special place in his heart. Lon and Barbara made the first six-figure donation in the athletic department’s history. UTRGV coach Lew Hill was one of Kruger’s longtime assistants from the UNLV and Oklahoma years. When Hill was being looked at for other head coaching opportunities in 2016, Kruger sold Hill on the benefits of living and working in the Valley.